Dr. Scott Moody, a recruiter for Harvard University came to River Valley to speak about the admittance process for Ivy League schools. 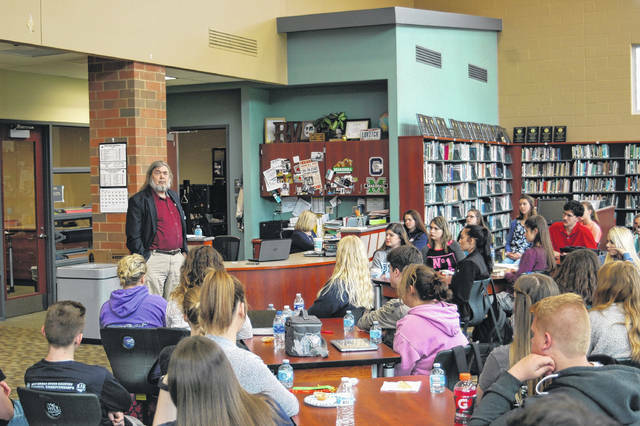 BIDWELL — River Valley Advanced Placement (AP) students had the opportunity to listen to Dr. Scott Moody, a professor at Ohio University and a recruiter for Ivy League schools. Keeping with the theme of “Diamonds in the Rough,” RV students are continually being encouraged by their teachers to achieve more than they expected of themselves. A recent article in the Gallipolis Daily Tribune which featured Sharla Moody being accepted to Yale, fits this theme of excelling despite where you are from. Scott spoke with students about the challenges and expectations when attending a major school, especially coming from a poor area like Appalachia. Scott, having grown up in rural Nebraska on a farm, attended a one room school house growing up. He explained that his love of reading and music led him to pursue the sciences and test well in high school, earning a full ride to the University of Nebraska. After visiting UN, he said he decided the classes were too large and the teachers too boring, so he applied to West Point, where he then said he was told by an entrance examiner, that he would be a poor candidate for a military officer because of his independent thinking and questioning mindset. That entrance examiner suggested he apply for Harvard. With this suggestion, Scott applied and was accepted with a full ride to Harvard. Since then, he has earned a masters and a doctorate from the University of Michigan. He has spent almost the past 40 years teaching in the medical and biological field at Ohio University. In 35 years of recruiting for Harvard and other Ivy League schools, he has interviewed over 250 students for the ivy leagues. Of those that have been interviewed, 15 have gone to Harvard with over 30 going on to an Ivy League institution. “I want to see more of you do well in school, to have that burning desire to do great things and contribute to society,” he said. Students had the chance to ask questions one on one with Dr. Moody and pick his brain about what interviewers and recruiters look for, not only for Ivy League schools, but higher education in general.